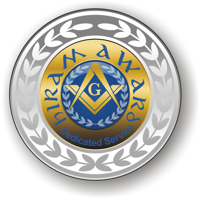 Hiram Award is considered the highest honor for service that can be bestowed upon a member by a Masonic Lodge. The Lodge may only designate for the Hiram Award a Master Mason who has served the Lodge and the Masonic Fraternity with devotion over and above the ordinary. Service as an officer or as Master of a Lodge shall not be in itself sufficient qualification for the award nor shall it be a disqualification. The award should be based on what the recipient has done, not what positions he has held. A lodge may present only one Hiram Award in one calendar year. Such limitation should not suggest that this award should be presented every year. CMC Sec. 408.020.